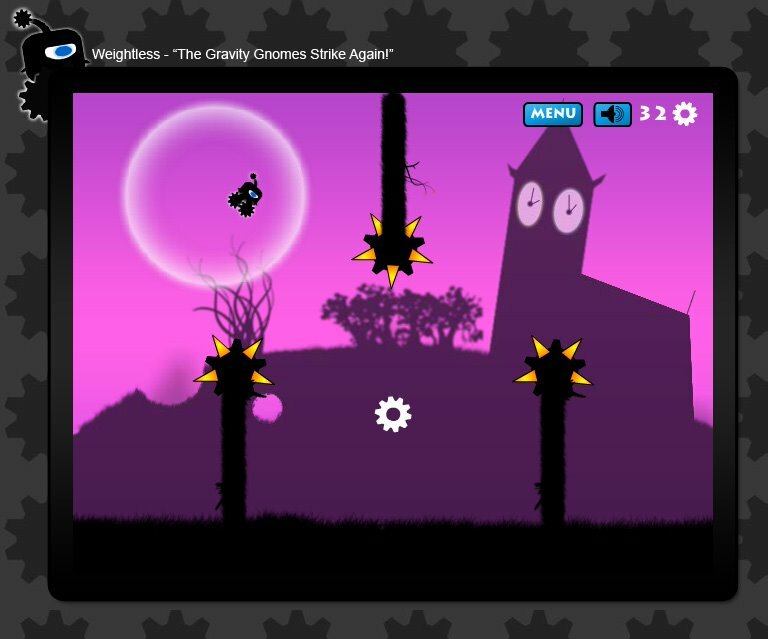 A puzzle platformer with unique gameplay mechanics, Weightless was originally developed during a 3 day enthusiast event. The player must navigate through a series of challenges in order to collect gears which will allow the player to progress to the next level. Players must avoid spikes and enemies a like by using Issac's unique ability to generate gravity bubbles. These bubbles can be used to fling Issac through the air and manipulate the environment. The game was developed by 4 people, Jason Khan(Game Designer), Noah Marton(Artist), Fraser Adams(Programmer),Som Kazemi(Audio). 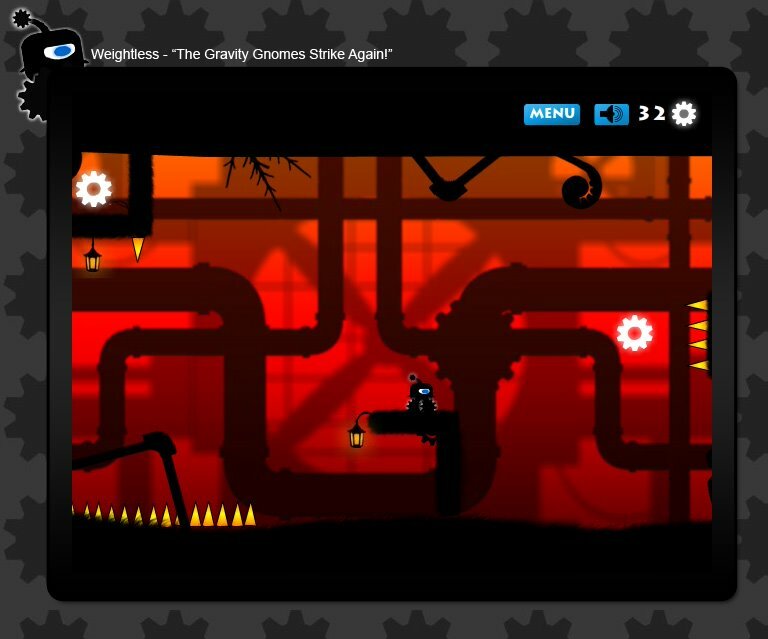 Weightless's first level was designed as an introductory stage in order to get the player used to the game's unconventional game mechanics. Challenges are evenly spaced throughout the level with varying degrees of difficulty in order to set a well balanced pace. Due to the parallax system the white background seen in this and the following screen shots are not visible during gameplay. This system helps to create the illusion of a 3d environment. Here you can view a larger version of the level. Players often become mentally exhausted if difficult challenges were continuously placed throughout the level. Subsequently, having easy challenges would bore the player. Gameplay was thus balanced to have peaks and falls in difficulty to optimize the players experience. New gameplay mechanics were introduced gradually as the game progressed. The goal was to have the player become comfortable with the mechanics and challenges before introducing them to new ones. This can be seen when floating spikes were added to the game. These spikes could be affected by gravity bubbles which allowed for a fun and dynamic experience. Here you can view a larger version of the level. Overall the development of Weightless was a great experience. It allowed me to experiment with unique game mechanics and the time spent working with play testers was invaluable. Watching players complete levels and giving feedback allowed me to make Weightless's levels much more fun and accessible. Like all games I still feel that Weightless was never truly finished. If I had the chance I would have liked to do even more playtesting and make some of the earlier levels easier in order to make the game appeal to a broader audience. The planet Gizmo is in peril! Take control of Issac and navigate through a world with no gravity. Collect gears while avoiding deadly spikes and vicious enemies in order to restore peace to Gizmo.